If you've missed the first two posts you can find them here. Today we're talking about donations: why it's good to donate, what kinds of things you can donate, where you can donate, and how to make it easy to donate as you declutter. As you declutter, you'll come across things you're ready to let go of, but that are in good enough condition that other people can still use them. If you have friends or family members who you can give things to that's a great option. It's fun seeing someone else use something that used to be yours. Young adults moving away from home or newlyweds just starting out could benefit from your excess furniture, linens, and household items. Families with younger children might appreciate hand-me-down clothes and toys. You can also donate those items to local charities, who will pass them on to people in need, or sell them and put the money towards people in need. If you have a charity that's special to you, you'll feel good knowing your possessions can support their cause. It can also help you let go when you know your belongings can really benefit someone else. Instead of something taking up space in your home or collecting dust, give it to someone who will actually use it and appreciate it. Donating also helps keep items out of landfills, which is good for the environment. Just make sure items are clean and in good working condition. Think about the people who will benefit from your things and what they would want given to them. Most charities are run by volunteers and they don't have the resources to fix broken items or get rid of unusable things. Put together a list of charities and organizations in your area and find out what their needs are, as well as what they don't want. Again, because so many charities have limited resources, don't burden them with items they don't need. 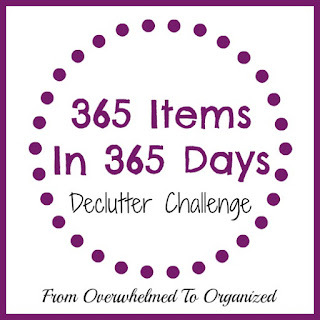 Some people throw most of their belongings away when they are decluttering because they feel it's too difficult to bother with donating things. But it doesn't have to be hard. 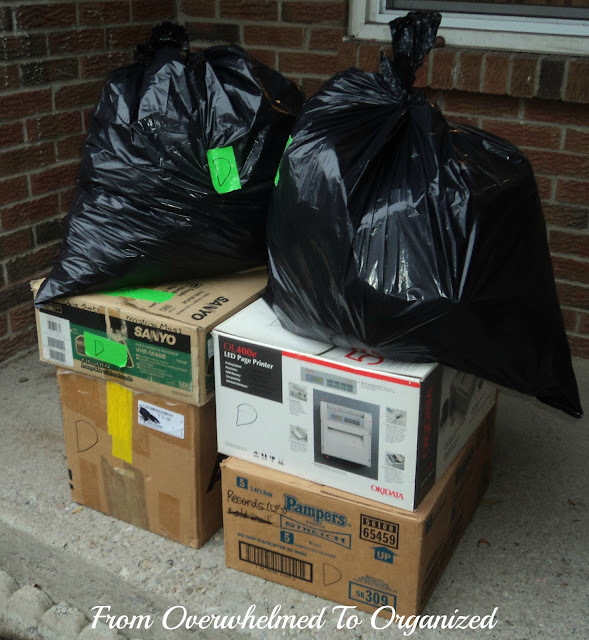 While you're in the midst of decluttering, it's good to have several large bags or empty boxes handy so you can easily add any donate-able items to them as you work. I usually use clear garbage bags like these with my clients to separate donations from garbage or recycling. Make donating part of your weekly routine. Find a time in your weekly schedule when you're driving near a donation center and make a point of dropping of donations every week at that time. You're nearby anyway so it's easy to pull up and drop off a bag or box. Many charities will even pick up donations from your porch or driveway. In my area the Canadian Diabetes Association Clothesline program and the Ontario Federation for Cerebral Palsy both do pick-ups. It's so easy! Here's a picture of some of my donations on my porch (they're marked with a D for Diabetes as instructed... we like to use duct tape to mark our bags and "busy" boxes so it's clear... and easy). 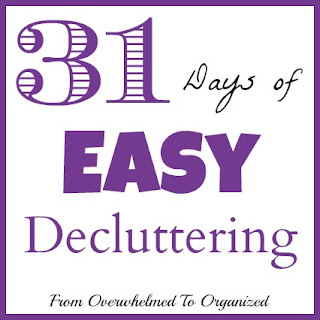 Here are a few easy steps for you to take today so you're ready when you start decluttering. Gather up some empty boxes or large bags. Duct tape and a good marker would be helpful too, so you can mark your bags or boxes so they aren't confused with anything else. Research charities in your organization to find out what kinds of things they need and what they will accept. Compile a list so you have a few options. Find out if there are charities that will pick up from your home and schedule a pick-up for sometime in early November. What kinds of items have you donated in the past? What can you donate now? Where do you like to donate your belongings? We came across an old coat in our storage shed, that belonged to my husband's paternal grandmother before he passed. I'm assuming it had never been worn because the price tag was still on. It's probably been in storage for several decades! As it doesn't fit either myself or my daughter, we're going to donate it. Now the question is where? Thanks for giving me many, many ideas! Wow LuAnn! What a great find! If it's considered "vintage" you may be able to sell it online or at a consignment shop. Otherwise, for donating, maybe a theatre that would take it for a prop if it's kind of unique. Good luck!